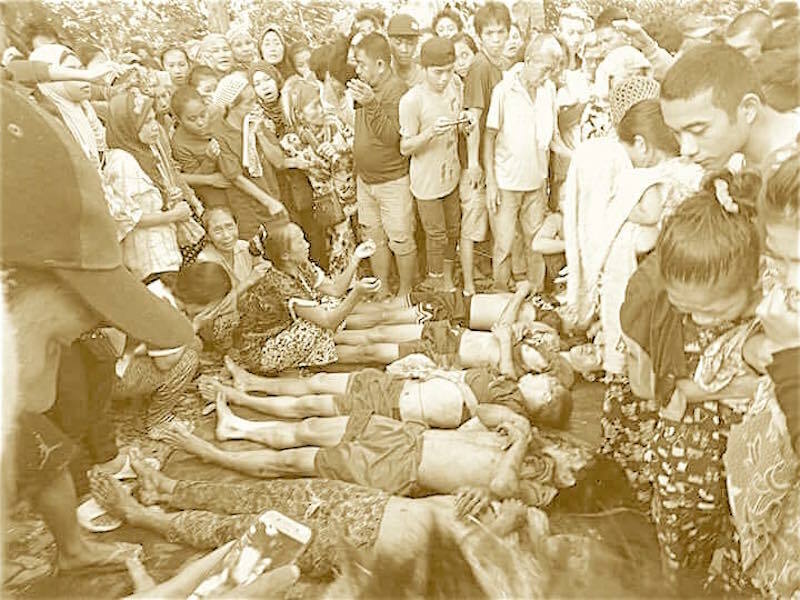 DAVAO CITY (MindaNews / 05 Oct) — Citing “ongoing military operations and other programmed command / unit activities,” three military officials in Sulu on Monday asked the Regional Human Rights Commission (RHRC) of the Autonomous Region in Muslim Mindanao for an extension until October 15 to answer claims of the families and witnesses that the seven persons slain in Patikul, town on September 14 were not Abu Sayyaf members but civilians harvesting fruits. Atty. Fatten Hinay, head of the BaSulTa (Basilan-Sulu-Tawi-tawi) sub-regional office of the RHRC told MindaNews they granted the motion filed by Brig. Gen. Divino Rey Pabayo, commander of the Joint Task Force Sulu requesting extension for him and the two other respondents — Col. Samuel Yungue, commander of Task Group Panther and Capt. Michael Asistores of the Scout Rangers. The RHRC served the subpoenas on the three officials on September 26, giving them until October 3 to “answer the allegations” cited in the affidavits of the families and witnesses. Hinay said she issued the order on Wednesday granting the motion for extension until October 15 to air their side. The Western Mindanao Command’s press release on September 15 said that while troops of Task Group Panther led by Yunque and the Scout Rangers led by Asistores were conducting a “focused military operation,” they encountered “more or less 100 fully armed Abu Sayyafs” under senior leader Radullan Sahiron and sub leaders Hatib Hajan Sawadjaan and Idang Susukan in Barangay Bakong, Patikul town. The Commission on Human Rights (CHR) had earlier sent a team from the central office in Manila and Western Mindanao CHR, in coordination with the RHRC to meet with and get the affidavits of the families of the victims and witnesses. The families also gave their consent to an exhumation of the bodies to determine the cause and manner of death, Atty. Jacqueline de Guia, CHR Executive Director had earlier told MindaNews. The exhumation is expected to be done soon. A relative of the victims had earlier told MindaNews the seven victims were among villagers who fled their sitios in Kabuntakas and evacuated to safer grounds due to armed conflict, allegedly after President Rodrigo Duterte declared martial Mindanao-wide on May 23, 2017. A common practice in conflict-affected areas is that residents who wish to return to their areas to harvest, for example, need to bring their identification cards and affix their signatures on the logbook at the military detachment and again report to the detachment when they have left the area. The subpoena duces tecum was not served on September 26 and 27 “because of (military) operation in Igasan, Patikul where the detachment is,” Hinay explained. But it was finally served afternoon, of September 28, she said. MindaNews has repeatedy followed up on the findings of the AFP probe. Galvez has yet to send his reply.